My first "new" vegetable encountered with my Urban Organic deliveries was Rainbow Chard! I had heard of it before, usually swiss never rainbow, but I had no idea what to do with it, and definitely had never had it in my refrigerator before!! So, if you're in the same boat as me, or just want a little more knowledge on this nutrition powerhouse-- -and a great recipe! hang on, here we go! 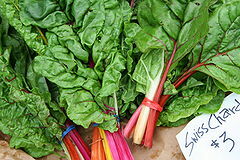 Chard, also known as Swiss chard, is a leafy vegetable. It is a multi-colored relative of the beetroot and one of the easiest vegetables to grow in your own garden! Chard may be steamed, sautéed, or braised, and it can be added to soups, stews, casseroles, and frittatas/omelets (YUM!). The leaves and stems may be cooked and served together, or prepared separately as two different vegetables; chard’s leaves can be prepared like spinach, and its stalks like asparagus. (In fact, its leaves serve as a good substitute for spinach in most recipes, but they will need to be cooked slightly longer) Fresh young chard can be used raw in salads, while mature chard leaves and stalks are typically cooked or sauteed (recipe below! ); their bitterness fades with cooking, leaving a refined flavor which is more delicate than that of cooked spinach. When choosing your chard: Choose chard with tender, glossy leaves and crisp stalks. Store unwashed chard, wrapped in a plastic bag, in the refrigerator for up to three days. Like other leafy vegetables, chard needs to be thoroughly washed before cooking since sand and other debris tend to nestle in its leaves. Instead of using a colander and running water over the leaves, the best way to remove debris from these leafy greens is to dunk and soak them in plenty of water. Place the leaves in a large bowl, pot, or sink filled with cold water and agitate the leaves one by one, then remove the individual leaves by hand and place them in another container. Pour out the water and repeat the procedure until the water is free of debris, then dry them in a spinner. Okay, are you ready for how good this stuff is for you? Chard’s vitamin K levels are almost shocking in their excess. There's enough vitamin K in one 150g serving of rainbow chard for six times your daily requirements. It's also packed with vitamins A, C and E (no, not the subway!). It is high in fiber and contains riboflavin and B6. It has high concentrations of manganese, magnesium, potassium, iron and other minerals. All of this amounts to a great food for preventing premature aging, colds and flu and aneamia. Chard is also high in beta-carotene, a strong anti-oxidant that helps to protect the eyes against sun damage and helps prevent heart disease and cancer. Just be sure to steam or cook as the cellular structure and oxalates need a little breaking down to get to that goodness. 1. In a large pot, heat 1/4 cup plus 2 tablespoons of the olive oil. Stir in the garlic and cook over moderately high heat until lightly golden, about 1 minute. Add the chard leaves in large handfuls, allowing each batch to wilt slightly before adding more. Season the chard with salt and pepper and cook, stirring, until the leaves are softened and most of the liquid has evaporated, about 8 minutes. Transfer the chard to a bowl. Wipe out the pot. 2. Add the remaining 2 tablespoons of olive oil to the pot. Add the chard ribs and cook over moderately high heat, stirring occasionally, until crisp-tender, about 5 minutes. Stir in the wilted chard leaves, season with salt and pepper, splash with lemon juice. Transfer to a bowl, sprinkle with the lemon zest and serve right away. Next recipe up for me to try: Rainbow Chard “Lasagna”! Bake at 375 degrees until browned and soft. I love Swiss Chard, and this looks like a great recipe! Thanks for sharing it on Chowstalker! It really is awesome! I eat Chard this way at least once a week. Thanks for posting the "lasagne" recipe! I'm not new to Rainbow Chard, but mature leaves have been in my co-op distribution for three weeks in a row now. Running out of ideas. I loved this recipe. I also added onions, kale and spinach and it was delicious. I've been growing Swiss chard in my small backyard for the last two years and never really knew what to do with it. I just made your recipe. Awesome!!!! New favorite recipe.